the event to initially take shape, invited Anas and Sandre to visit Haslmere's Town Hall. They were shown the bespoke stained-glass window – depicting the Coat of Arms and the original Elizabeth I Charter. They were able to research more into the heritage, history and imagery of the Coat of Arms and also discuss the next step forwards for the Coat of Arms Weaving. local printers Dragon Print combined their skills to produce the A1-sized 'rug knot template' as a semi-transparent design on paper. This full-colour print depicted the Coat of Arms design overlaid with a 2-by-2mm squared grid, as per Anas' mathematical calculations, where each square of the grid represented a rug knot that would be hand-woven by Anas – nearly 800,000 in total. ON A TRADITIONAL RUG LOOM, BY A MASTER RUG CRAFTSMAN! coat of arms' depicted colourways. This painstaking, but invaluable part of the process, took approximately three months to compete. They also began the process of hand dyeing each skein of hand-spun wool to be used in the weaving, using only a colour palette of natural dyes and the traditional dye-dipping and drying methods, so that the colour is gradually and evenly permanently absorbed into the wool fibres. Anas and Sandre also sourced natural coloured silk threads from Haslemere haberdashers: Baker & Sons, and hand dyed them for the weaving. Anas then began the process of 'setting up' the loom. 2-mm spacing for each warp thread that would be attached along the top and bottom of the wooden-framed loom. He then inserted a row of 'pegs' at these 2-mm measured points on the loom. Once completed, Anas then attached hand-spun cotton to the pegs along the top and bottom of the loom, to form a double row of warp threads. The warp threads were divided into two rows – front and back. These two rows were then braced with a 'heddle rod' that was inserted between them to stretch and maintain the correct tension of the weave. Each hand-woven knot in the weave needs two warp threads to create it. As the knots are woven across the loom, from right to left, they form the 'weft'. Together, these warps and weft threads form the 'foundation' of the weave. When the weaving is finished and cut from the loom, these warp threads form the rug fringes at either end. As a Rug Specialist, Rug Dealer and fourth-generation Master Rug Craftsman, who hails from a family rug business spanning more than 100 years (having celebrated their Centenary in 2010) and with over 30 years of experience including eight years of traditional rug training, Anas has all the necessary expertise and skills to hand-dye the wool and silk threads and create any colour match needed for the weave. Any remaining skeins or threads are added to the 'wall of colour' in the Restoration and Repairs studio. 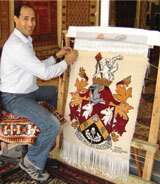 Anas was then ready to begin hand-weaving the Haslemere Coat of Arms. First, he weaved one row of 'sumak' (a flat weave) in black cotton thread, to 'stop the ends' from unravelling after the weave is completed and cut from the loom. Next, Anas weaved 10 rows of kilim flatweave (without a knot or pile) in white cotton thread. These rows were interwoven across the warp threads to secure the rug weave. Once these initial rows of 'kilim' weave were in place, Anas could then begin to hand-weave the Coat of Arms rug-knot design, using the gridded square template design as the definitive pattern and knot guide, while Sandre applied her textile experience and skills to help weave in areas of colour. two hours and 30 minutes for Anas to weave one 'line' (equal to three actual rows) of weave. Once a line of weave had been completed, Anas used a traditional hand-crafted metal comb to compact the weaved rows. approximately two years to complete and measures 80 x 100 cms. In November 2008, during a visit to The Oriental Rug Gallery Ltd, Haslemere Town Hall Clerk Mike O'Neil was invited to weave a rug knot by Anas and Sandre. And so the idea for an 'Open Weave' event – where every one could hand weave a rug knot into the Haslemere Coat of Arms – was created. AN OPPORTUNITY TO HAND-WEAVE A RUG KNOT AND BE A PART OF HASLEMERE'S HISTORY! The Mayor and Mayoress of Haslemere William and Carole King were joined by VIP guests, representing the Haslemere-wide Societies, Associations and the community, for the Ceremonial Launch of the 'Open Weave' event for Haslemere In Stitches – the hand-weaving of the Haslemere Coat of Arms, which took place at The Oriental Rug Gallery Ltd in March 2009. Mayor King stressed the importance of the ongoing event for the community: "Open Weave is an opportunity for the people, businesses and schools to become part of our Town's heritage. I am very proud that Haslemere has the prestigious honour of being the first-ever town in the UK to have its Coat of Arms hand-woven in wool and silk on a traditional weaving loom by a Master Rug Craftsman. 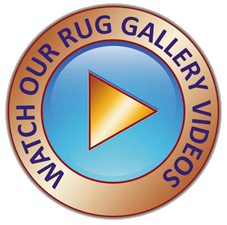 I encourage as many of you as possible to visit the Gallery and weave your rug knots into our Town's history and heritage." AN INVITATION TO HAND-WEAVE YOUR RUG KNOT! You are welcome to take part in this FREE event and hand-weave your rug knot from 10am to 5pm, Monday through to Saturday from March 2009 to March 2010, when you next visit The Oriental Rug Gallery Ltd. 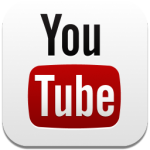 It takes just 5 minutes to do, with Anas or Sandre on hand to guide you. Everyone who participates will be awarded a personalised Completion of Weave Certificate, depicting the Coat of Arms and an 'X' marking the actual placement of your rug knot in the weaving, in recognition of your achievement. We look forward to seeing you! Hand-woven on a loom by Anas – a Master Rug Craftsman. Come in and watch Haslemere's Coat of Arms come to life! During the Open Weave Event, Sandre and Anas were thrilled for The Oriental Rug Gallery Ltd to be personally invited to take part in the Haslemere Festival 2009, by Chairman Hamish Donaldson. This prestigious Surrey event was a wonderful opportunity to share their Master Rug Craftsman & Decorative Arts passion, skills, knowledge and expertise of hand-woven rugs, carpets, and tapestries. The Gallery's sell-out Festival event took place at the Haslemere Educational Museum and began with opening introductions given by Mayor Melanie Odell CBE and former Mayor, Councillor Fay Foster CBE to attending guests. Both praised the couple's ongoing commitment and endeavours in sharing their rug knowledge and passion through their Haslemere Coat of Arms Weaving events: Open Weave and Schools In Stitches, at their Rug Gallery in Wey Hill. 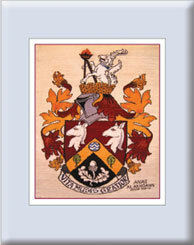 rug knots into the Coat of Arms Weaving and subsequently receiving personalised Certificates of Weave in recognition of their achievements. The Weaving was transported to the Museum from the Gallery – complete with its traditional rug-weaving loom – especially for the event. courtesy of Cllr. James Mackie. 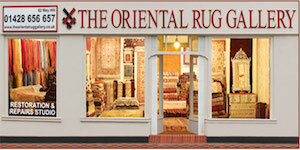 Copyright The Oriental Rug Gallery Ltd 2011. Anas' father Suhil – the-third generation Master Rug Craftsman of the family's 100-year old rug business, flew in from Damascus, Syria for the event and further rug seminars in London. As well as being a highly respected Rug and Carpet Specialist and the family's current Ajami Rug Gallery Director, Suhil was formerly a long-standing Middle East Chamber of Business and Commerce Merchant Member, and introduced to those attending the Haslemere Festival event by Madam Mayor Cllr. Melanie Odell. 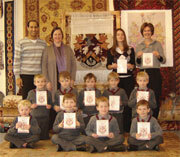 The Launch of the Schools in Stitches Initiative got off to a flying start in November 2009, with Haslemere Mayor of Melanie Odell giving a warm welcoming speech to the school children and teachers of Camelsdale Primary School and Shottermill Infant School, who attended the launch event organised by Anas and Sandre at The Oriental Rug Gallery Ltd in Wey Hill, Haslemere. "Haslemere In Stitches is an important event for our town and we are very proud of it. By weaving your rug knots, you will be come part of Haslemere's history in the making and be forever woven into its fabric for all time," said the Mayor to the schoolchildren and the teachers present. 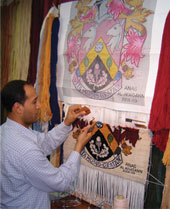 the meaning of the heraldic symbols used, rug craftsmanship and the creative use of mathematical-based techniques involved in the weaving's creation. Pupils and teachers alike weaved their rug knots into the Haslemere In Stitches weaving and proudly received their coveted Certificates of Weave. "Through our Schools in Stitches Initiative we hoped to encourage the schoolchildren's interest and pride in their town's history and coat of arms heritage, as well as providing an opportunity to highlight Haslemere's local craftsmen community, of which there is a huge diversity," said Sandre, who has been a Haslemere Business Chamber Committee member during the weaving's two-year creation, and is focused on keeping local crafts peoples' skills and knowledge alive in the community. "We've had a fantastic response to the Schools In Stitches Initiative from all the teachers and schoolchildren alike, who have participated in this five-month event, so far. They are all so thrilled to hand-weave a rug knot into Haslemere In Stitches and be a part of their Town's Coat of Arms weaving. It's truly inspiring!" said Sandre. "The weaving has garnered a huge amount of local community interest, as well as attracting a wide range of visitors to the Town from all parts of the UK and even from countries such as the USA, Australia, South Africa, New Zealand, France, Italy and Switzerland, to name but a few – many of whom had never previously visited or even heard of Haslemere before they came to our Gallery to weave their rug knots. 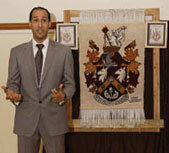 Haslemere In Stitches has definitely put the town on the UK map," said Anas. After weaving their rug knots, visitors are encouraged by Anas and Sandre to visit the main attractions of the town, such as the The Haslemere Educational Museum, thereby helping to promote local businesses and shops in the town and surrounding districts, while encouraging more people to shop in the area. Once the hand-weaving and rug-knotting of the weaving was completed, Anas and Sandre prepared the silk and wool piece for its forthcoming Mayoral Reception at Haslemere Educational Museum. Still attached to the loom by its warp threads, the weaving 'pile' – formed by the hand-woven rug knots – was carefully evened up by shearing off the excess fibre lengths, using a specialist rug pile shearing tool, to give the weave an overall evenly layered pile finish. Afterwards, the pile was 'combed' through to lie flat and the 'polished' to enhance the pile and give it lustre. Now, the Haslemere Coat of Arms Weaving was ready for the formal presentation to the Mayor and its gifting to the Town and the community. 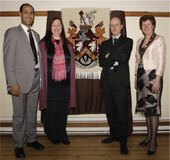 "A GIFT TO BE TREASURED, AS PART OF HASLEMERE'S HERITAGE", was how Haslemere Mayor Melanie Odell described the hand-woven and rug-knotted Haslemere Coat of Arms weaving gifted from The Oriental Rug Gallery Ltd at the formal Mayoral Reception ceremony, held at Haslemere Educational Museum on 24th March 2010. The evening's event was a resounding success, with more than 160 distinguished guests, including five further Royally-appointed representatives, invited by the Mayor of Haslemere to attend the Reception. Upon arrival, guests were formally announced by Haslemere's Town Crier: Mr Terry Burns and included the Vice Lord Lieutenant of Surrey Gordon Lee Steere, the High Sheriff of Surrey Lady Elizabeth Toulson CBE, the Right Honourable Lord Hayter, the Mayor of Waverley Cllr Carole Cockburn, The Worshipful Company of Weavers (London), The College of Arms (London), the Heraldic Society (London), The Decorative & Fine Arts Society, the President of Haslemere Museum, Surrey Police, the President of Haslemere & District Chamber of Trade & Commerce, the Leader of Waverley Council and other eminent members including society presidents, past mayors, local dignitaries, as well as businesses from London, Haslemere Town and Surrey-wide. Haslemere Mayor Melanie Odell praised Anas' years of expertise and specialist rug knowledge: "This weaving project is undoubtedly worthy of the distinguished guests attending this reception. We can only admire the dedication and enthusiasm that Anas and Sandre have put into this beautiful hand-crafted weaving and have watched in wonder as Anas weaves thousands of rug knots, as we have struggled to weave our own. "The Weaving has attracted more than 1,160 visitors to the Gallery from all parts of the UK, as well as from around the world. Therefore, on behalf of the Town, may I congratulate Anas and Sandre for their vision, enthusiasm and dedication in creating 'Haslemere In Stitches' and for definitely putting our Town on the UK map. Haslemere now has the prestigious honour of being the first-ever town in the UK to have its Coat of Arms hand-woven and rug-knotted on a traditional rug loom by a Master Rug Craftsman." Afterwards, Haslemere Chamber President Melissa King described Anas' weaving talent and The Oriental Rug Gallery Ltd as a "shinning beacon of excellence" during her Presidential speech to attending guests. The Haslemere Town Crier announces the official unveiling of the Haslemere Coat of Arms Weaving at The Mayoral Reception held at the Haslemere Educational Museum. 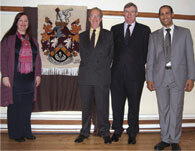 From left: Mr Terry Burns, Anas & Sandre, Museum Chairman: Alan Berry, Mayor Melaine Odell, Cllr. William King, Museum Curator: Julia Tanner, Haslemere Chamber President: Melissa King. 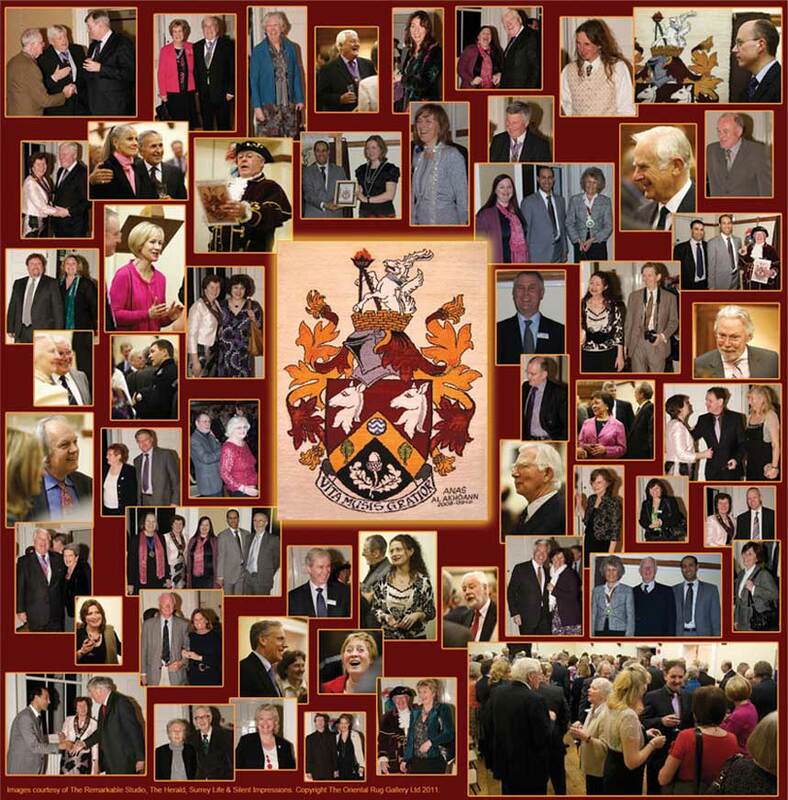 The Oriental Rug Gallery Ltd's Haslemere Coat of arms Weaving is a creative heritage collaboration with Haslemere Educational Museum, Haslemere Town Council and Haslemere & District Chamber of Trade & Commerce. the weaving, stitch by stitch, knot by knot, breath by breath." The Mayor then assisted Anas with the task of detaching the weaving from the loom, by cutting across the warp threads at the top and bottom of the loom. The Mayor then formally handed the weaving to Alan Perry Chairman and Julia Tanner Curator of The Haslemere Educational Museum. weave for the future," said Melanie. 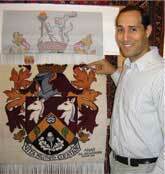 and rug-knotted coat of arms on behalf of the town. and the spirit of our community." From clockwise top left: The Vice Lord Lieutenant of Surrey: Mr Gordon Le Steere DL. The National Association of Decorative & Fine Arts Chairman: Mrs Jane Stopford-Russell. The High Sheriff of Surrey Lady Elizabeth Toulson CBE & Past Master World Trader-Tallow Liveryman of the City of London & past Mayor of Haslemere Councillor William King. Surrey Police: PC Ralph Swindell. Haslemere Educational Museum Chairman: Mr Alan Berry and Curator Ms Julia Tanner. Waverley Borough Council Leader: Mr Robert Knowles with Mrs Knowles (senior). Haslemere Chamber President: Mrs Melissa King with Mrs Pamela Blake and Tribal Art & Textiles specialist: Ms Vanessa Ballard. Waverley Borough Mayor: Mrs Carole Cockburn. Haslemere Educational Museum President: Mr & Mrs Bernard Coe Mr & Mrs Bernard Coe. 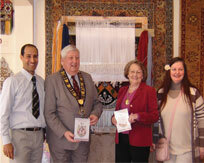 Haslemere Mayor Melanie Odell, Anas and Sandre. After the Mayoral Reception, where the weaving was cut along the warp threads attaching it to the loom, it was then carefully wrapped and stored in the Museum archives ready for the final stage of preparation – the specially commissioned, custom-built mounting and framing of the weaving for public display and permanent installation at the Museum. As the Museum is a privately funded initiative, six sponsors came forward and generously contributed funds towards the framing and mounting of the weave, as part of Haslemere Town's decorative arts heritage. The Sponsors are: The Worshipful Company of Weavers; Mr Clive Cheesman, Richmond Herald for the College of Arms; The Barbara Whatmore Charity Trust; Sheen Botanical Labels; The Erica Leonard Charitable Trust; Mr Phil Bates of Grayshott Pottery. The next stage involved the Museum commissioning its specialist heritage conservators: Far Post Design led by designer Mr Mike Cashman, for the bespoke mounting and custom-built framing of the Weaving. With more than 25 years' experience in the heritage sector, Far Post Design has a wealth of skills and knowledge to deliver the project on time and within budget. Mike Cashman visited the Gallery and the weaving was brought over from the Museum. Mike began by measuring the weaving and discuss the stretching, mounting and glass box framing specifications with Anas and Sandre, where non-reflective glass would be used and fitted close to the weaving, to ensure that every each individual rug knot could be viewed in detail. mount and building the bespoke glass-fronted box frame. A SPECIAL AND WONDERFUL WEAVING FOR OUR TOWN! "Such is the great care and dedication Anas and Sandre have shown in creating this very special and wonderful Weaving for our Town, which has resulted in a truly exceptional two-year community event," was how Haslemere Mayor Councillor Melanie Odell described the Haslemere Coat of Arms Weaving, as she formally unveiled the rug-knotted weaving to attending guests at Haslemere Educational Museum in March 2011. 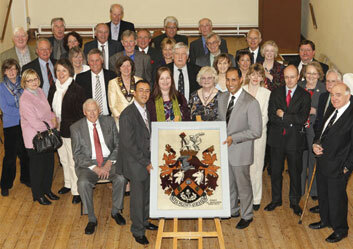 The Mayoral Inauguration celebrated the successful completion and the subsequent mounting and framing of The Oriental Rug Gallery Ltd's two-year rug-weaving project entitled: 'Haslemere In Stitches', detailing the Haslemere Coat of Arms, which has been installed and is now on permanent public display at Haslemere Educational Museum. 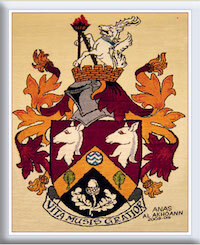 Anas, a fourth-generation Master Rug Craftsman and Sandre, a Designer, Editor and Rug Interiors Consultant, are proprietors of The Oriental Rug Gallery Ltd in Wey Hill and were inspired to design, hand-weave and rug-knot the Haslemere Coat of Arms, as a gift for Haslemere Town. During her speech to guests present, Mayor Melanie Odell praised Anas and Sandre's expertise and specialist rug knowledge: "We are so very fortunate that you brought your rug skills and expertise to our town." The Mayor concluded by saying: "Our most special thanks go to Anas and Sandre for their gift. I am very honoured to be part of this wonderful Weaving event." 'Haslemere In Stitches' was designed by Anas and Sandre to involve as wide a cross-section of the community as possible in its creation and subsequent installation at the Museum: "Our aim is to continue focusing and highlighting the Haslemere Coat of Arms weaving as a visibly dynamic and interactive educational weaving tool in the making, now that it is on permanent public display at Haslemere Educational Museum. 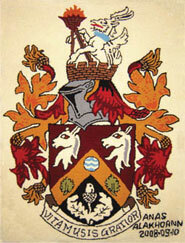 "We will also endeavour to encourage and build upon the ongoing interest in the Town's coat of arms heritage and history, that we originally researched with the Heraldry Society and the College of Arms for 'Haslemere In Stitches', in forthcoming collaborations with the Museum and at our Gallery talks and events (see 'Gallery Events'), while continuing to highlight Haslemere's local crafts people skills, of which there is a huge diversity. "The weaving and its ongoing events give us the opportunity to share our rug and carpet knowledge and passion with others: as well as demonstrating the learned skills of a Master Rug Craftsman in hand-weaving rug knots; and for us to give professional expert advise on how to repair, restore, clean and conserve any type of hand-woven rugs, carpets or textiles (see Our Services). 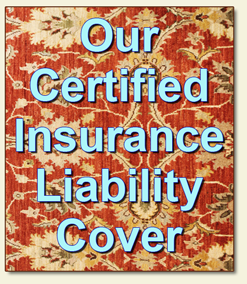 "We passionately believe in preserving these ancient Master Rug Craftsman skills and techniques. Where, by reaching out into the community with the Haslemere Coat of Arms weaving and through our endeavours to demonstrate and offer people an opportunity to hand weave a rug knot, we hope that we may have inspired at least one of the next generation of potential weavers as they sat and wove their rug knot into the fabric of Haslemere's historical heritage, here at The Oriental Rug Gallery Ltd."
Sheen Botantical Lables have kindly offered to hand- engrave one of their superior quality black laminate labels, as a specially commissioned, hand-crafted plaque to accompany the Coat of Arms Weaving, installed at Haslemere Educational Museum. Sponsors for the mounting and framing of the piece. weaving at the Museum for everyone to see and enjoy. 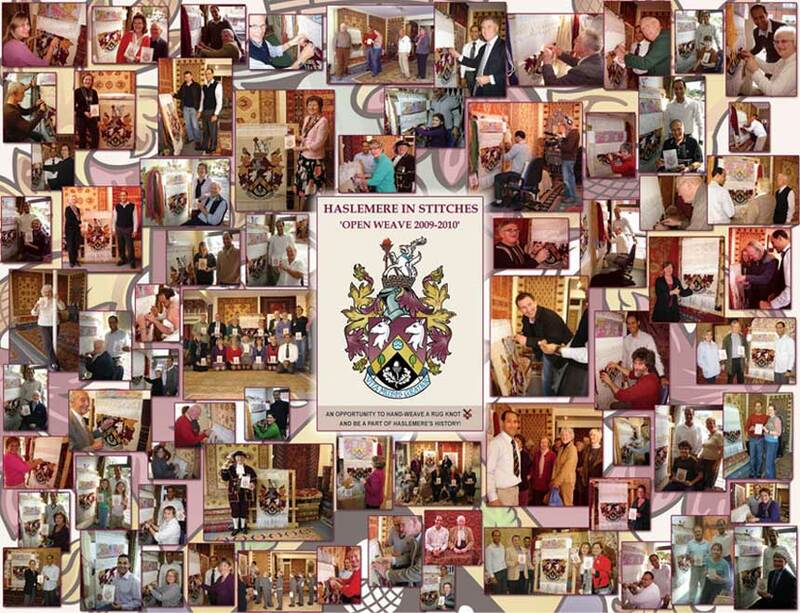 To further support the Coat of Arms Weaving at the Museum, a DVD entitled: 'Haslemere In Stitches: a journey of 800,000 rug knots' is being produced by The Oriental Rug Gallery Ltd. 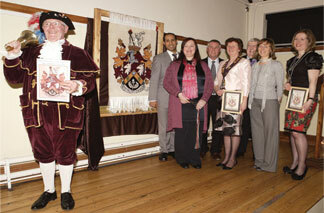 The DVD will include Sponsors' details; colour images detailing the Mayoral Reception and the Mayoral Inauguration occasions; a short film of Anas weaving the Coat of Arms in-situ at the Gallery; hundreds of images of those who visited the Gallery to participate in Haslemere In Stitches to weave their rug knots; filming of the former Town Crier Terry Burns, resplendent in uniform, announcing the weaving; as well as a pdf of the StoryBoard. 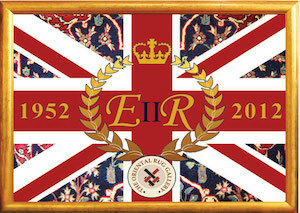 Also, a limited edition of specially commissioned, hand-tufted 'replica weavings' the same size as the original Coat of Arms weaving (80 x 100 cms) are also being produced by The Oriental Rug Gallery. 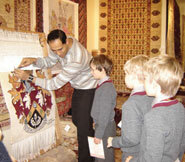 Both items are creative heritage collaborations between The Oriental Rug Gallery Ltd and Haslemere Educational Museum. they will be available for purchase at the Museum Shop. All proceeds of sale will go directly towards supporting the facilitation of the Museum and its continued educational activities worldwide.